Predation is a primary agency of natural selection affecting the evolution of skeletal form in gastropods. The nature of antipredatory defence depends on how predators attack their prey as well as on the types and quantities of resources that are available to the potential victims. Here I review the five main methods of predation on shell-bearing gastropods (swallowing prey whole, apertural entry, drilling, shell breakage, and partial consumption) and 31 categories of shell and opercular defence that are effective at one or more of the three stages of predation (detection, pursuit, and subjugation). These categories are evaluated for marine Palaeozoic, marine Late Mesozoic to Recent, freshwater, and terrestrial environments. The five types of predation are common in most environments, but drilling and partial consumption are absent in freshwater and unlikely in the Marine Palaeozoic, and partial consumption may be rare on land. The fewest specialized defences are found in freshwater, followed by the marine Palaeozoic and Recent terrestrial environments. There has been a sharp rise in the number of defence types and in the degree of antipredatory specialization in marine environments from the Palaeozoic to the Recent, particularly among defences at the subjugation and pursuit phases of attack. The small number of defences and the passive nature of shellbased protective traits in terrestrial gastropods contrast with the high diversity of antipredatory adaptations, including those related to aggression and speed, in other land-dwelling animal clades. G.J. VERMEIJ. Fossil predation: did some clavilithine fasciolariid gastropods employ valve-wedging to feed on bivalves? Several gastropods, including members of the Busyconinae, wedge or chip bivalve prey by inserting the outer lip between the valves. This habit, which is associated with an abapically downwardly convex outer lip, often results in breakage and subsequent repair of the lip. I tested the hypothesis that convex-lipped clavilithines from the Eocene of France and the Neogene of Indonesia had higher frequencies of repair than their straight-lipped counterparts. Although this prediction was verified, frequencies of repair are low (0 to 0.19) compared to those of busyconines, indicating either that prey bivalves were small or that the predators are smaller than most busyconines. A large sample rich in empty Bithynia tentaculata (Linnaeus, 1758) was collected in a drift-line along Lake IJssel, The Netherlands. Of 400 adult Bithynia shells 62 (15.5%) showed repair of a damaged outer lip, most probably due to failed attacks by predators. The roach Rutilus rutilus (Linnaeus, 1758) was probably its main shell-crushing predator here. However, repair after physical damage by waves breaking on the stones of the dike cannot be excluded completely. The predatory behaviour of Poiretia snails is studied. One aspect of this behaviour is the ability to make holes in the shells of prey snails. The radula and the histology of the mucous glands support the assumption that Poiretia secretes acidic mucus to produce these holes. Observation of a Poiretia compressa (Mousson, 1859) specimen yielded the insight that its activities relied on the availability of moisture and not on light conditions. It preyed on a wide range of snail species, but only produced holes in shells when the aperture was blocked. It usually stabbed its prey with a quick motion of the radula. The time it spent feeding on a prey specimen is most likely correlated to prey size. S. BERGAMIN & A. SMITS. How do the molluscivorous beetles Carabus granulatus and Phosphuga atrata (Insecta, Coleoptera) deal with sinistral and dextral prey? Predators of asymmetric prey (such as snails) are often asymmetric themselves or display a predation behaviour that is adapted to the asymmetry of their prey. We studied predation of sinistral and dextral forms of the freshwater snail Lymnaea stagnalis (Linnaeus, 1758) by two snail-feeding beetle species, Phosphuga atrata (Linnaeus, 1758) and Carabus granulatus Linnaeus, 1758. We investigated a possible preference for or more efficient predation of prey items with a certain coiling direction. We found that C. granulatus displayed a preference for dextral snails, as opposed to P. atrata, which did not show any preference. We also looked at the asymmetry of the mandibles. In C. granulatus the left mandible overlay the right one in a higher proportion of specimens (93.7%) than in the non-molluscivorous carabid, Calosoma inquisitor (Linnaeus, 1758) (86.7%), whereas these differences were reversed in P. atrata and the non-molluscivorous silphid Oiceoptoma thoracicum (Linnaeus, 1758) (77.0% and 87.4%, respectively). We discuss our results in the context of differences in feeding behaviour: C. granulatus uses its mandibles to tear the body of the snail as it has withdrawn itself in its shell, whereas P. atrata feeds by pre-digesting the snail. The tropical tree snails of the subgenus Amphidromus s.str. receive much attention from researchers because populations consist of roughly equal proportions of dextral and sinistral individuals. Studies indicate that this stable genetic antisymmetry is maintained because of disassortative mating. Deviations of the theoretically expected 50:50 proportion have, however, been frequently reported. An explanation for this deviation could be modulation by chirally biased predation. On the island of Kapas, Malaysia, seventeen individuals of Gecarcoidea lalandii, a nocturnal terrestrial crab, were caught and housed with live Amphidromus inversus. A low level of predation by the crab on the snails was found. However, there is no reason to assume that predation by G. lalandii is chirally biased. 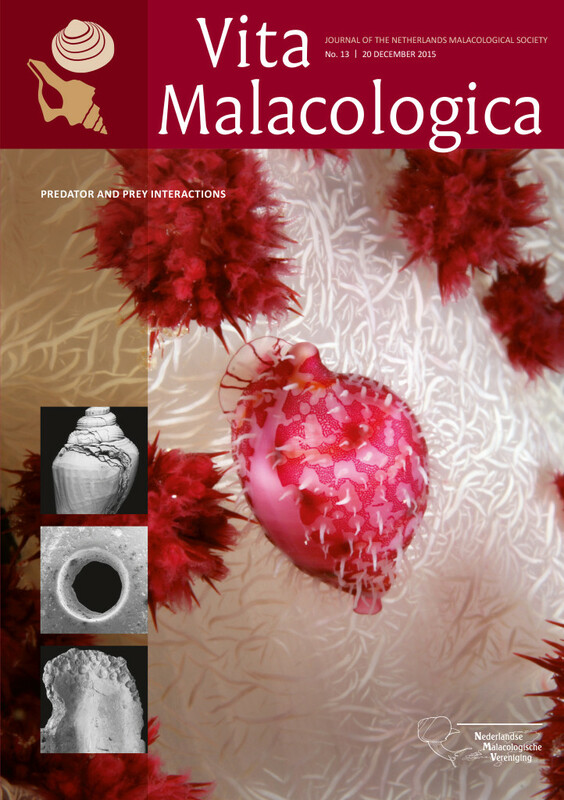 We conducted a laboratory study to determine drillhole siteselectivity patterns in the predatory behavior of Notocochlis unifasciata (Lamarck, 1822), which is a common naticid gastropod on the eastern Pacific coast of Central America, preying on two infaunal venerid bivalves – the thin-shelled and weakly ornamented Leukoma grata (Say, 1831) and the thick-shelled and strongly ornamented Iliochione subrugosa (Wood, 1828). Spatial patterns of drillhole distribution indicate strong preferences for drilling the umbonal region and the ventral edge of the shell, with the proportion of edge- to wall-drilling attacks increasing in thicker, strongly ornamented prey that were larger than their predator’s own size. Drilling patterns from museum and beach samples of I. subrugosa collected across the geographic range of N. unifasciata (Panama to Costa Rica) were consistent with laboratory findings. Review of the confirmed cases of edge-drilling behavior by other naticids indicates that this study is the first confirmed report of the behavior in the naticid subfamily Naticinae. In light of these findings, we discuss hypotheses on the geography and ecology of edge-drilling predation by subtropical and tropical naticids to guide future research.